While not the main reference in this article, but by far the most astonishing, was a description of people forming betting "pools" in Indianapolis cafes the day before the first Indianapolis 500 wagering on how many drivers and riding mechanics would be killed in the race. 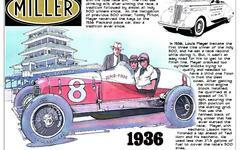 Other items covered include plans for Carl Fisher to pace the race at 40 mph, and for the Indianapolis Motor Speedway to set of aerial bombs including one that would somehow unfurl a giant American flag at the start of the race. Additional color includes the overflowing hotels, residents opening their homes to out-of-town guests, traffic patterns and train schedules. Lots of great color. The article ran in the May 30, 1911 Indianapolis Star.